Years ago back in the UK, I used to go on bushcraft weekends. I thought I took this along on the last one I went on but either I am mistaken or it is a better knife than I thought as it shows no obvious sign of wear (that I can see anyway), like new. 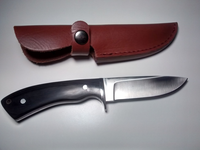 Full tang, 440 stainless steel blade (it is about 4 mm at its thickest), concave grind, sharp! 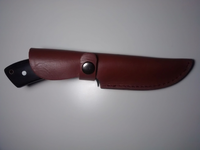 Deep leather sheath with stud closure. Prefer local sale (HAHA swap-meet time anyone?) but could post at cost (probably about $15 as it is above the magic cheap letter rate). I went to the doctor and asked if he had anything for wind. He gave me a kite.